Though it was late, my brother and I decided to get one more game in (since I brought two decks home with me). I had a 3 Land hand to start out. My brother had one land, but used it for Rhys and an Essence Warden, and eventually worked his way up to a Heritage Druid and Seedcradle Witch and a bunch of other elves. I managed to turn many of his Elves into Pigs with Curse of Swine, and then was able to Aetherize a large attacking army of elves and insects. I drew a bunch of cards off of a Recurring Insight, and was able to pull off the Proteus Staff trick with Soramaro and stack my deck, though by that point it was a two hit General Damage Kill. This one didn’t go on too long, but it was okay, since I had to get up in the morning to be on the road to the airport. This one is another “Creatureless” deck, with no other creatures but the general. The whole idea is to just draw a lot of cards and make the general big (and maybe stack the deck with Proteus Staff). This deck is going to end up being somewhat similar to the Kruphix deck I’m building, but I’ll likely keep both, as this one is a “Creatureless” deck. The second game of the night was a smaller one. The Prossh deck had been tricked out to include the Food Chain combo and be a bit more threatening. It started out with an early Scroll Rack, Beastmaster Ascension and Blade of the Bloodchief. I started with decent lands and a Leyline of Anticipation. Knowing that Prossh was going to be dangerous, I held onto a Hinder until he tried to hit the board. Oloro was gaining life via Sun Droplet, and drawing cards with Well of Lost Dreams (and also had Ajani’s Pridemate, the Wall that gains life and another way to get counters from Life). I cast Intet early on, and she hit several times (She birthed out a Hypersonic Dragon, as well as casting Praetor’s Counsel, Brainstorm, Kabooom! and a Darksteel Colossus). I was able to Genesis Wave for 7 (hitting only 2 lands) and then Epic Experiment for 11 (hitting only 1 spell). A Charmbreaker Devils-ed Epic Experiment for 9 hit 3 spells, but a foolish Time Reversal resulted in me losing a really good hand. However, despite Oloro going up to 222 life (though he realized after the fact that he had been playing Sun Droplet wrong) I was able to bounce his blockers with my very first playing of Jace the Mind Sculptor (FTV 20, unsleeved) and swing in for General Damage with Intet. The deck did what it was supposed to: mess with the top of my library and cast Genesis Wave and Epic Experiment more than once. The goal of this deck is to get a lot of mana and recur Genesis Wave and Epic Experiment while messing around with the top of the library via Jace, Scroll Rack, etc. There are a few “instants and sorceries matter” cards in here. For this game, the Emmara player switched to Ruric, and the Mimeoplasm-er swapped for the other new BUG commander from the original pre-cons. Since it was the last game of the evening, I decided to play mono white. I started out with my general on turn 1 and followed it up with Infiltration Lens and Reconnaissance (one of my favorite enchantments ever). 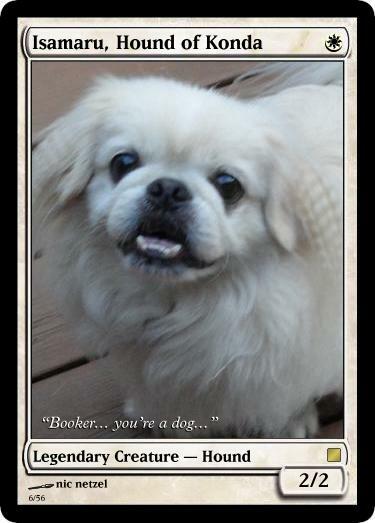 Those two permanents set up a situation where I’m either hitting for general damage or keeping Booker (as I call Isamaru, after my sister’s quite-deadly Pekingese featured on the proxy card art) alive and drawing two cards. Balthor played a withered wretch, Damia built up an army of huge dudes via the Hyrda that doubles things, Master Biomancer, Corpse Jack Menace (2 after it was cloned). However the Kami of False Hope sitting on my board kept Damia swinging elsewhere. 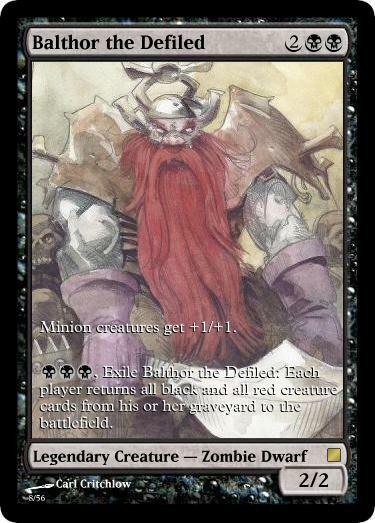 The store was getting close to closing, so I chose not to rescue Balthor from a killing blow by Damia, and I did the same for Ruric. I was left with a large board of small creatures vs an exponentially growing army of destruction. My general had been gaining counters via Daily Regimen, and my mana was being doubled (or tripled) for awhile by other people’s spells. Ultimately I was able to give Isamaru protection from Green and get get by Damia’s defenses (which luckily were all partial green… I lucked out when he didn’t Vraska my enchantment) and get in for enough General Damage to win, the Kami of False Hope an an un-morphed Frontline Strategist keeping his attacks at bay. Every single thing in the deck costs a singe mana. The general hits the board on turn 1 almost every game. Despite this restriction, this deck is pretty resilient. It has access to good removal for artifacts, enchantments and creatures. It has recursion tricks and some tutoring, and it can be a pretty effective Voltron deck if need arises. It’s A LOT of fun to play, and when it doesn’t win, it’s still a ton of fun. It does sort of get wrecked by Pernicious Deed or Ratchet Bomb. Also I get to look at the deceptively happy face of my Sister’s dog, Booker, when I play it. He is a scary dude, and I have no doubt that he would take out a Phyrexian Dreadnought in a fight. Another battle through the plains vs my brother (whose middle name is Rhys). This time we landed on the Aether Flues and pretty much stayed there. I was quite happy to be able to sacrifice creatures into my graveyard. I started with 3 lands and I entombed for Death’s Shadow right off the bat, and rolled Chaos to play a Krosan Tusker. Rhys played a taunting elf and Pianna, Nomad Captain. I play a Fierce Empath, get an Aetherling and sac it to AetherFlues for an Eternal Witness which gets back Entomb (cast for Doomgape). E.Witness flues into an Acidic Slime. Meanwhile, Rhys has sacced Valor, and has an Elvish Archdruid, lots of Elves and Ezuri basically waiting to crush me, but I’m able to get Mimeoplasm onto the battlefield as an Aetherling with 13 extra counters. I swing, unblockable and pump up to 23 for a one shot General Damage kill. This is a mimeoplasm deck. It puts good or large things in the graveyard for Mimeoplasm to eat and become. I don’t know that mine has anything particularly special about it. When Lions Eye Diamond got unbanned, I slammed that one right in there. Second turn Mimeoplasm is fun times (I’ve only done it once, swung for 16 and then lost him to targeted removal).